Austin, Christine and Clayton Moore are pictured with what they hope will be prize-winning chickens. Christine and Daniel Moore’s two sons, Austin and Clayton, will be showing their Cornish Rock hens at the Highland County Fair this year. They’ve heard all the chicken jokes, like why did the chicken cross the road to go to where a house was being built? The answer — to see a man lay a brick! But for the Moores, taking an animal to the fair is serious business. “I was in 4-H when I was younger, and later on I became an advisor, and then got my kids into 4-H showing animals, basically to keep them out of trouble,” Christine said. While most people think of steers, feeder calves and hogs when it comes to the fair, Moore said her sons like the chickens best. Her sons are part of the Pigs Plus 4-H Club and have been showing chickens for the past four years, but for a time took Boer goats to the fair. His 15-year-old brother Austin claims an expertise with his feathered friends. Both boys appreciate the fact that the chicken is a “low maintenance” show animal. When it comes to the big show at the fair, judges aren’t just looking at the chickens, but are sizing up those showing them as well. There are also standards concerning their showmanship, appearance and control of their animal. As for a shot at grand champion, both boys feel confident in themselves and their birds. If their chickens find a buyer at the fair, it could mean a substantial amount of money for the teens. For Clayton, his money is going into an account to be set aside for education. Austin has other plans, though. “I’m buying me a truck,” he said. 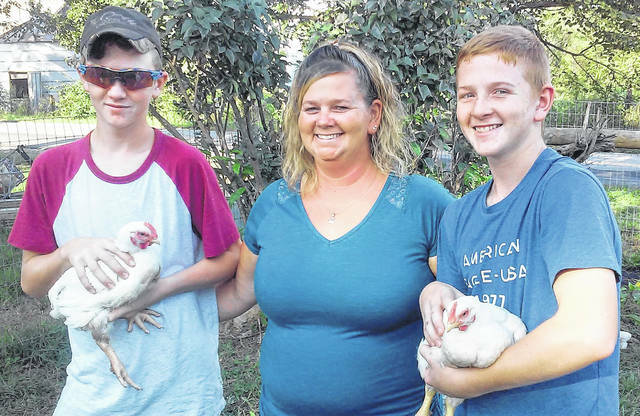 The Poultry Meat Pen Sale and Single Fryer Rabbit Sale are scheduled for Thursday, Sept. 6 starting at 1 p.m.
https://www.timesgazette.com/wp-content/uploads/sites/33/2018/09/web1_Morore-kids-pic.jpgAustin, Christine and Clayton Moore are pictured with what they hope will be prize-winning chickens.